Hey CBB Fans!! There’s a huge Back To School Contest Alert at the bottom of this post Just for my Readers! Whenever I read a back to school article I automatically think about the little kiddies going to elementary school so today I wanted to address, all students. Plus, consider snacks not only for at school but as after school snacks as well especially when studying. What I want to stress before I start this post about school snacks is that we all have our own definition of healthy so keep that in mind with the snacks I’m sharing. These are snacks I’d send with our son to school and snacks I took to University when I was a student. I also want you to consider your grocery budget as it may differ from mine or someone else reading this post. Buy what fits in your budget but aim to keep snacks as healthy as you can. Students from Junior Kindergarten to University all need to eat which means bringing a lunch which would be the optimal frugal way. 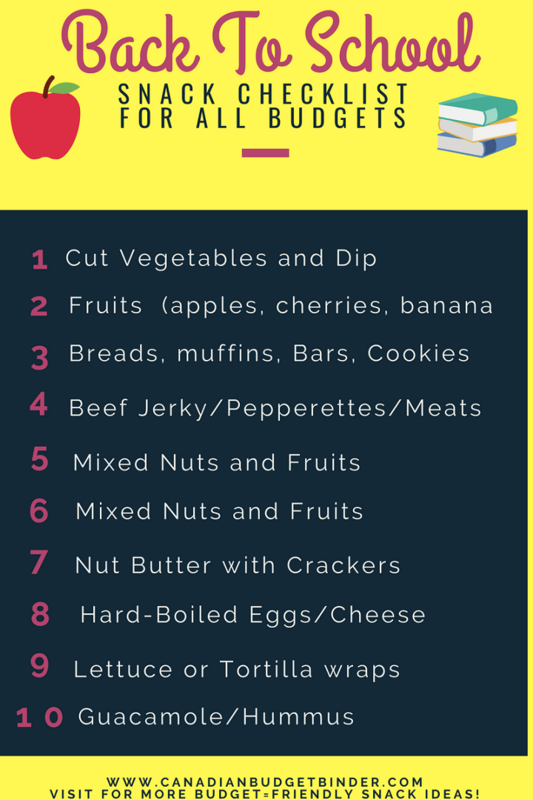 Some students may have meal plans but aside from those having healthy inexpensive school snacks for those on-the-go moments are essential. If you’re a parent to elementary students you already know that most schools have a no-peanut policy which means if the product includes peanuts, don’t bring it to school. This is to protect kids that have food allergies. You may have more than just peanut butter depending on what allergies are identified at the beginning of the school year so talk to your school and see what you can and cannot bring. As far as I’m aware high school, college and university students can pack whatever school snacks they’d like for the day. This means you have plenty of options especially when the budget is tight. Consider for a moment though if you were to eat breakfast at a fast food coffee shop for $5 what you could buy at the grocery store. I’m betting you could get a bag of bagels and 227g pack of cream cheese at the least which means you’ve got breakfast for at least 5 days for the 1 breakfast you bought on the run. Try to avoid these impulse food choices because they will only set you back financially especially when you are a student. Even after you move on budgeting for stuff like eating out is important to your overall financial success. When I went back to school in Canada I was 29 years old and the worst thing I did was not take a lunch. I was one of those guys who didn’t take the time to pack a lunch but always remembered my coffee. I did however always have school snacks with me because I found eating something was better than nothing at all. I found on days that I didn’t have snacks with me that I was tired even though I had coffee. Eating something small and filling my tummy took my mind off the growl and back on the books. I was a book-worm and yes I graduated top of my class but I had a push which is why I’m encouraging other students to take the snack break, you deserve it. I should probably stop and give credit to Mrs. CBB right here because it was with her urging to bring snacks to school that I even considered it and she was right. There were many times that I appreciated that break from studying just to enjoy a crisp apple outside in the fall or homemade granola bars or muffins that she would make for me. I wasn’t much of a veggie guy but I loved beef jerky which I’d get packed in my lunch bag secretly by Mrs. CBB. In fact I often found secret snacks stashed in my bag with little motivational sticky notes letters which really made my day. Going back to school as an adult is no easy task but it can be done. All you high school kids out there reading this or parents of kids in high school make sure you pack healthy snacks in your bag to go because even you too need to take a break. Eat healthy and you’ll feel healthy from the inside out. Now that we have a wee one who is not so tiny anymore entering junior kindergarten in just 2 weeks we’ve had to step up our school snacks game. just like adults need snack time so do the kids and as you know snacks are encouraged from a young age to keep kids from overeating and alert during the day. After a one hour meeting with the school the parents have been informed what can and cannot be brought to school for lunch and snacks. This was probably the one part of the meeting that we were dreading since we weren’t sure what we were going to do. Creating a back to school snacks list was at the top of our agenda which is why I wanted to motivate all of you to do the same. The problem we face as parents is that we have a picky eater which means our options are limited. Since one of our son’s favourite snacks is peanut butter we had to cross that off the list due to school allergies. Instead we’ve been offering him almond butter and cashew butter instead to see how he gets on with it. He actually loves it which works out for us but at a cost $11.99 a 500g jar. Other snacks he loves is fresh-cut cucumbers, bananas, muffins, oatmeal chocolate chip banana loaf, blueberries, watermelon chunks, strawberries, pepperettes, beef jerky, pepperoni slices, salami (he’s a meat-eater) Anything to do with cured meats, he’s in. On occasion he will eat nuts but not often although we try to encourage mixed nuts without peanuts. If you don’t have a picky eater you can easily get back to school snacks happy with all sorts of healthy treats that fit in your budget. Come the end of August and into September there are SO MANY deals on at the grocery store which is a great time to stock up. On the other hand if you are like Mrs. CBB and love to do the homemade thing than making apple sauce, pudding, muffins, breads and even crackers might be on your baking to-do list. We just went apple picking for the first time at the farm on Saturday with our son and he loved it. The apples are just starting to come ready so we plan to visit a few more orchards over the next couple of months. I want to thank McSweeney’s Premium Jerky and Meat Snacks for offering a huge Back To School McSweeney’s Snack Pack worth over $100 loaded with their products for one lucky CBB fan!! The contest is running on Facebook and the Blog for 5 days ending Saturday August 25, 2018 at Midnight. A winner will be randomly drawn from all entries on both Facebook and the blog. 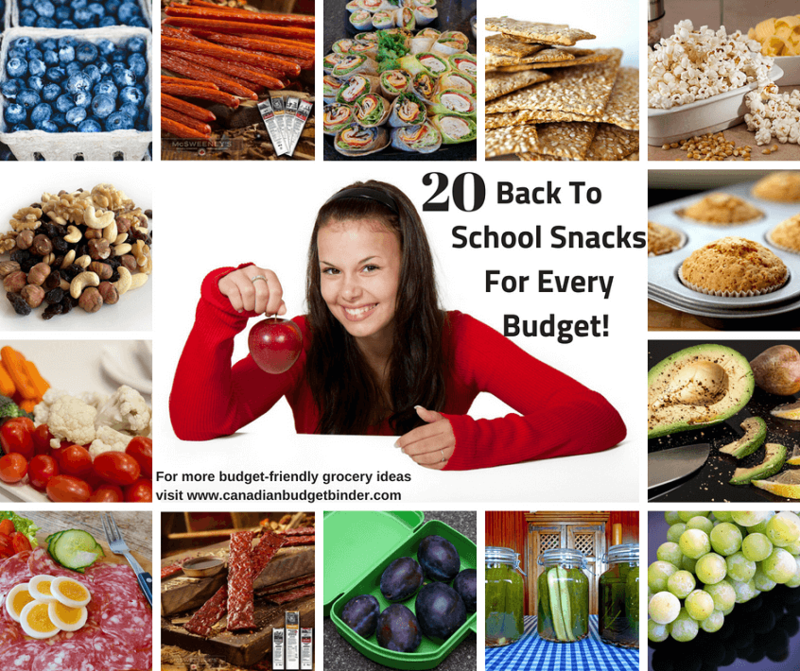 To Enter on the blog you must be a subscriber of the Canadian Budget Binder blog (I will check) and leave a comment below of your favourite back to school snacks. That’s all!! To Enter on Facebook simply LIKE Canadian Budget Binder and McSweeney’s Canada and comment on the Contest Post on CBB sharing your favourite back to school snacks. One entry each per person/Facebook/email/Blog so up to two total per person! Note: Open to Canada Only. Sorry to all my readers outside of Canada. I’ll have a contest soon for Everyone, I promise! We bought milk at Shoppers Drug Mart at 20x the points which put us over even more however we got back almost 5000 points which is equal to $5.00 or a free 4L bag of milk. We will be fine for milk until our next shop. We still have a $25 PC gift card to use up as well from the bread incident. For snacks, we like to have muffins, fruit, pepperoni sticks, pudding and cheese. Snacks in our house usually consist of sliced up garlic sausage, strawberries, salt and vinegar chips and Reeses peanut butter cups. My grandson loves garlic sausage, strawberries and a pudding cup in his lunch. My daughter loves strawberries in her lunch bag. My favourite back to school snacks are: homemade muffins, granola bars, cut up fruits, veggies with hummus and crackers! Thank you for this giveaway also subscribed to emails. My daughter likes to have meat, cheese and crackers for school! 🙂 thanks. So much great info! We are dairy free and use lots of nuts in our snacks at home, but since the school Is a nut free school I have to save those snacks for after school instead. How do I become a subscriber of the Canadian Budget Binder blog? Is using FeedBurner Email Subscriptions correct? It was time to re-stock our crispers a little…can you tell? OUR CURRENT TOTAL UNUSED RESERVES ARE $1,484.83. This means the 1,761.30 that we carried forward from 2017 PLUS AN ADDITIONAL $1,122.78 that we have added in 2018, LESS $1,399.25 that we have drawn out for use in 2018. 1 Hubby got FREE hot dog buns, Kaiser buns and Brioche buns at the bakery. 2. That’s Molson Non-Alcoholic Beer…not a bad price with our rain check. Oh just wait Mr CBB…next week is another BIG summer shop but we are taking a couple of trips in September and I expect there to be very little shopping then. Oh did I miss that in the post? I’m going to go look. Great deal Larry.